Miami Trace’s Isaac Abare makes the return during his first singles match against Chillicothe Thursday, April 4, 2019 at Miami Trace High School. 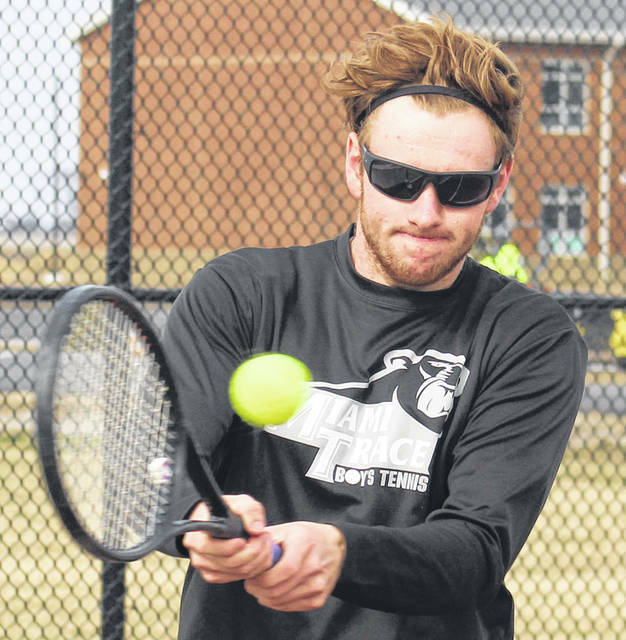 On a day that changed from sunny and nice to windy and overcast and colder as the afternoon turned into evening, the Miami Trace tennis team hosted the team from Chillicothe High School for a Frontier Athletic Conference match Thursday, April 4. Miami Trace won the match, five courts to none. At second singles, Devin Riggs beat Garrett Anders, 6-1, 6-0. Jack Ivers defeated Kate Connor at third singles, 6-0, 6-3. At first doubles, Rylan Gardner and Caleb Perry beat Silas McDaniel and Reese Hatfield, 6-0, 6-0. Rounding out varsity play, Kody Burns and Jake Harris defeated Corrine Woods and Haven James, 6-1, 6-2. There were two j-v matches, with the Panthers winning both. Angelo Macioce and Sebastian Gurruchaga won, 10-1 and Austin Musser and Brayden Jackson won, also 10-1. Miami Trace is now 1-1 on the season, 1-1 in the FAC. The Panthers are back in action at home Monday against Jackson at 4:30 p.m.